“If Valve’s SteamOS isn’t ready, we’ll just make do with Windows,” said gaming-PC manufacturers. And so it was done. Steam Machines have begun to hit retail sans the SteamOS. And if the smallish form factor Digital Storm Bolt II is an indication of what we can look forward to, that’s a-okay with us. To be fair, Digital Storm’s Bolt line existed long before Valve ever kicked off its Steam Machine initiative. And in terms of its hardware build, the Bolt II is identical to what Digital Steam’s first Steam Machine would have been. It’s a beautiful machine no matter which OS it might run. In case you can’t tell from the photos, the Bolt II is small: We’re talking 16 inches tall, 14 inches deep, and just 4.5 inches wide. That’s nothing compared to most desktop gaming rigs. And this incarnation of the Bolt II features feet on its left side, so that you can lay it horizontally or vertically against the side wall of your entertainment center without worrying that it will suffocate and overheat. This machine is thinner than my A/V receiver. And that’s perfect for the Bolt II’s mission: bringing high-end PC gaming into the living room. The trade-off, of course, is internal expandability: The Bolt II is a tightly tailored machine with absolutely no wasted interior space. It’s not quite as cramped as a laptop, and it’s not as awkward to work inside of as the original Bolt, but it’s far from spacious. The 'Pick two: Small, powerful, cheap' paradigm is in play here. It’s not as if the Bolt II is crowded for no reason, anyway. Au contraire, the Bolt II is packed with hardware, and that’s what makes it such an interesting sell for the living room. The model Digital Storm provided us for review was the top-of-the-line, $2857 configuration, with a liquid-cooled Intel Core i7-4790K processor and a video card based on Nvidia’s GeForce GTX 780 Ti graphics processor. 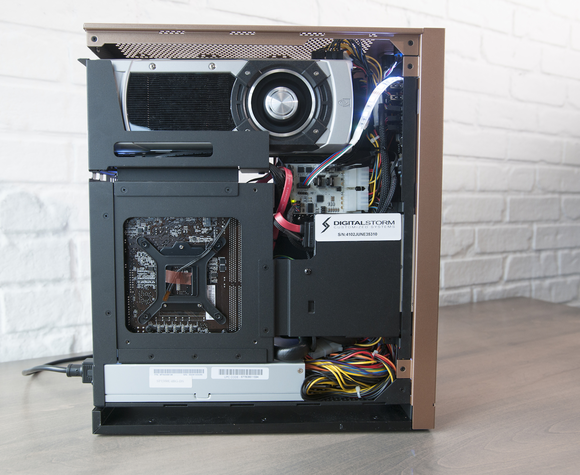 The components are packed tight inside the case, but Digital Storm's engineers made sure you can access everything without too much trouble. 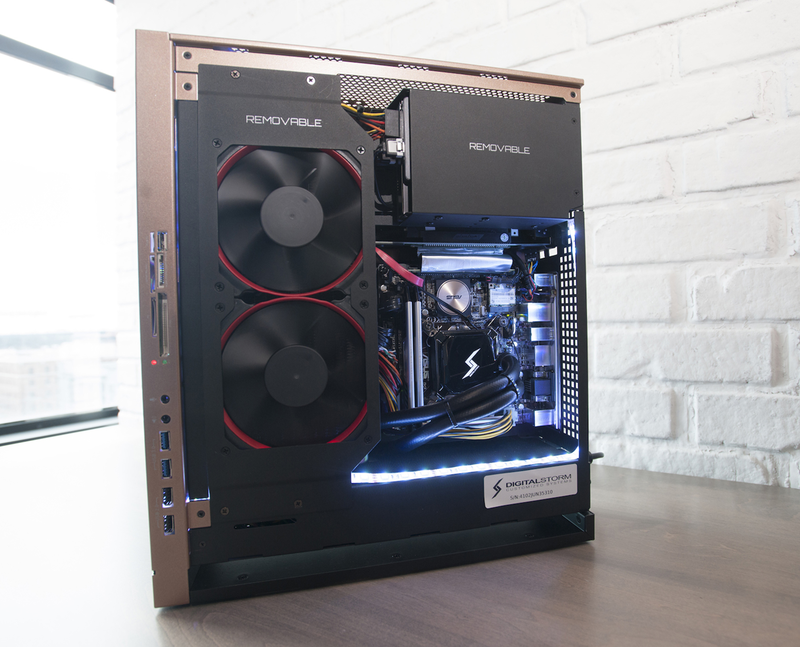 Digital Storm offers three other pre-built SKUs, with the least-expensive model selling for $1725. That one comes with a Core i5-4590 CPU—cooled by a heatsink and fan—and a video card based on Nvidia’s GeForce GTX 760. Each of the four models can be customized to your liking. The model reviewed here also comes with 16GB of DDR3/1600 memory; a 120GB SSD; a 1TB, 7200rpm hard drive; and a slot-feed DVD burner. The RAM is easy enough to replace, but swapping hard drives requires removing and replacing an internal drive bay. There is no room for a second video card—or adding any other type of card—so SLI configurations are out of the question. Check out how that video card is mounted! 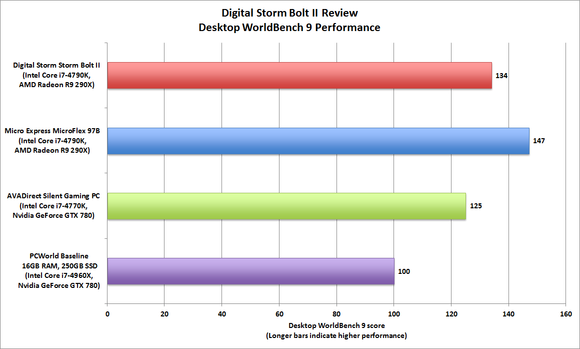 Still, the Bolt II took everything we threw at it with aplomb, producing a Desktop Worldbench 9 score of 134. That score is 34 percent higher than that of our baseline desktop, which features an Intel Core i7-4960X and an Nvidia GeForce GTX 780. In fact, only one machine we’ve reviewed recently has scored higher—the generic-looking Micro Express MicroFlex 97B, which scored a 147. The Micro Express MicroFlex 97B edged the Digital Storm Bolt II on our productivity-oriented benchmarks, but that rig would never fit—much less survive—in your entertainment center. 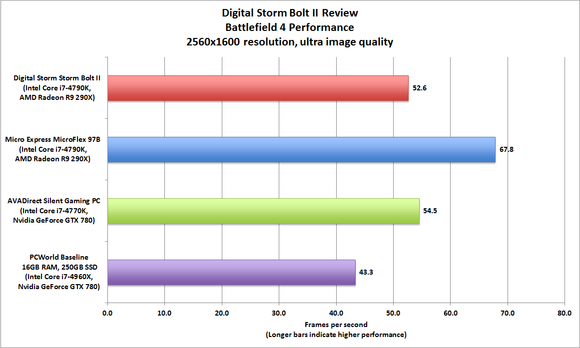 Then again, the MicroFlex 97B beat the Bolt II on only one gaming benchmark: Running Battlefield 4 2560x1600 resolution with image quality at ultra, the MicroFlex’s AMD R9 290X graphics card pumped out 68 frames per second to the Bolt II’s 52. In every other case, however, the Bolt II outperformed the MicroFlex and a host of other machines. BioShock Infinite at 2560x1600 with visual quality at ultra? A whopping 73.8 frames per second. Compare that to 57 for the MicroFlex and 58 for our baseline system. This was the only gaming benchmark where the Bolt II didn't finish in first place. And lest you forget, that oversized performance is coming from a seriously tiny machine. I do have a few complaints about the case. Most importantly, it gets hot. That’s no surprise, considering how little space is inside the case and how much performance this baby packs in, but it makes me worry about the longevity of the system under that extra stress. To its credit, Digital Storm includes a host of software tools for monitoring temperatures, but that’s an added hassle compared to a system with plenty of airflow. I also don’t like the front-panel USB, mic, headphone, and other ports being located on the side of the case. That makes them very awkward to access, and heaven forbid you should decide to place the right side of the tower against the wall (that would block them entirely). Orient the case horizontally, and any cables you plug in will stick inelegantly straight up in the air. Locating the front I/O ports on the side of the machine is far from optimal. And why not give us the choice to nix the optical drive? Finally, I could do without the optical drive. It spoils the machine’s sleek looks, and who relies on discs in this age of digital media streaming? What’s even more annoying is that Digital Storm’s online order system will let you upgrade from a DVD burner to a Blu-ray drive for an additional $85, but it won't let you delete an unwanted drive for a credit. Okay, now add up what the Bolt II’s parts would cost if you built your own PC. Go ahead, I know you’ve already started. You’ll probably conclude that this machine is overpriced. You’re looking at $700 for a 780 Ti. Throw in another $350 for the 4790K, a couple hundred for storage, and so on. You’re gonna come up well short of the Bolt II’s $2,857 price tag. What you can’t include in your spreadsheet is the engineering cost to design this system. The “Pick two: Small, powerful, cheap” paradigm is in play here. You’re paying for a quiet, small system that can sit unobtrusively in your living room or look great in your office. Yes, you could assemble the same collection of components, stick them in a behemoth of a tower case, and come in a few dollars cheaper. You must decide if the Boutique PC Tax is worth paying. 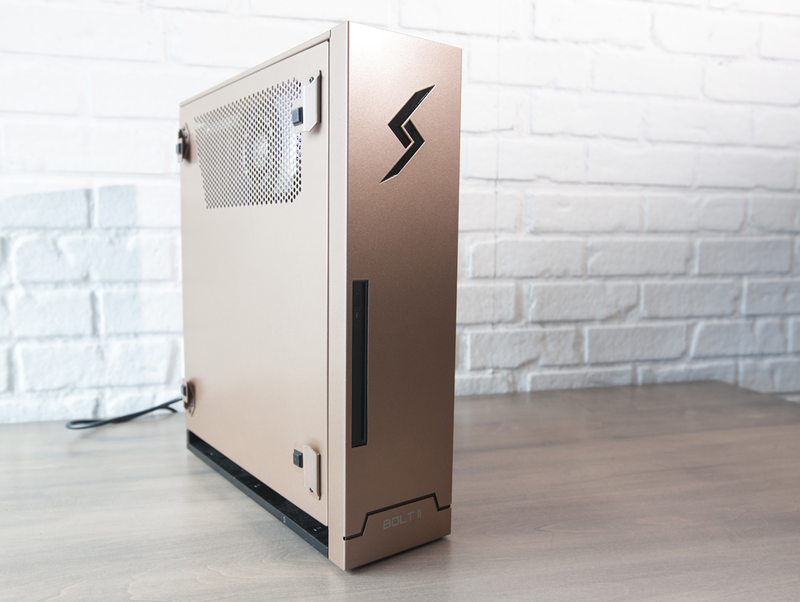 The Bolt II is a powerful desktop gaming system without the desktop footprint. Could it go in your living room? Sure. Could it go in your office? Absolutely. It’s a beautiful system, regardless of what use you find for it. Awkward ports and a hot case aside, this is PC engineering at its finest. On the other hand, you sacrifice some upgradability and (potentially) longevity. And then there’s the price tag. Even stuffed with top-of-the-line hardware, it’s clear you’re paying at least as much for design and engineering as you are for components and a case. It’s a niche product for a niche consumer, and it looks mighty pretty on a shelf. As for SteamOS? Maybe next year. 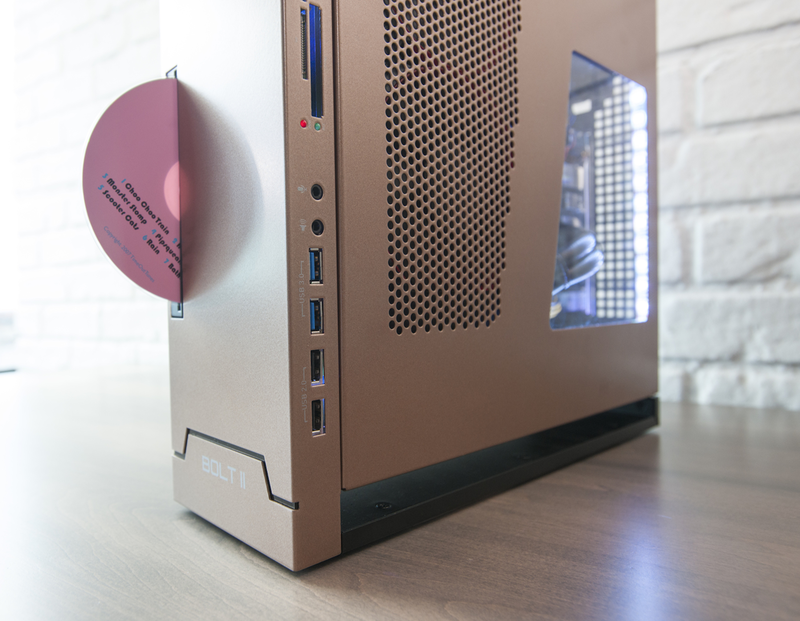 The Bolt II proves that you don’t need a massive gaming tower to get massive gaming performance—as long as you’re willing to pay for the privilege of petite.